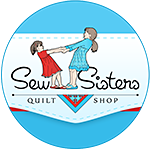 Today, a customer picked up her finished quilt that she pieced for her grandson...and we got her sewing machine working for her. 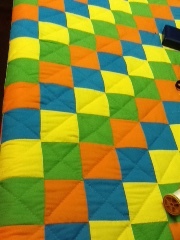 Here is the quilt I finished hand quilting and bound for her...the second one done for her this fall. Trip around the world.....no marking!!! Will save lots of time, and going to be very pretty. 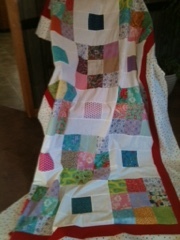 I am ready for the Christmas blog hop starting on Thursday...my day is Friday. I sure hope Friday the 13 th is smooth!!!!! Here is my design wall...yes, I have one!! 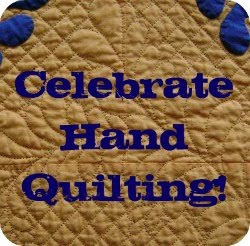 My sewing buddies got me one in July for my birthday!!! Ten bottles of nail polish now...I think that is it. 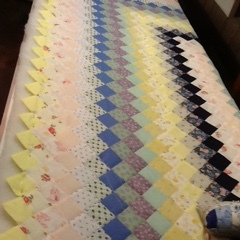 I will alternate with a plain block and border...I think. 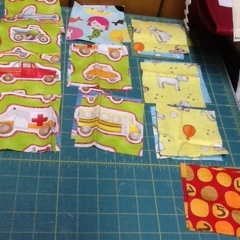 And, I have a small start on an I Spy quilt...just wall,hanging size. These are so cute!!! I have this one pin based for my Tiara now...ready to go. Ok.....that's it for me this week..thanks for visiting. Have a great Remembrance Day! 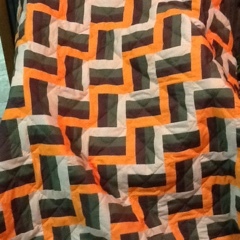 Marjorie as always great quilts. The nail polish blocks are super cute. you always have so much on the go...amazing! That looks like a busy week. 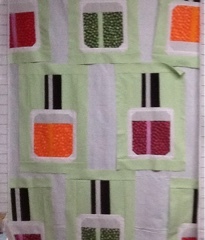 I like the colors in the one that is ready for hand quilting. Love your nail polish blocks!